There’s a midcentury modern light brown leather couch. A house with a window lined with dark brown wooden shutters. A shelf made from the back of an iMac. A media console on wheels with iron legs and wooden slats. Cinnamon rolls. None of this is a coincidence. Pinterest’s engineers have been refining the app’s recommendation systems for years. People in the U.S., like me, are used to this sort of personalization. But now Pinterest has more than 150 million monthly active users, and most of the people joining are outside the U.S. So to continue the growth — usage is up about 50 percent year over year, as last year there were 100 million monthly active users — Pinterest has taken new approaches, including artificial intelligence, a faster system for ranking, and localization of content. Of course, other up-and-coming companies, like Airbnb and Spotify, are also personalizing and localizing their content to accumulate more users and keep them around. 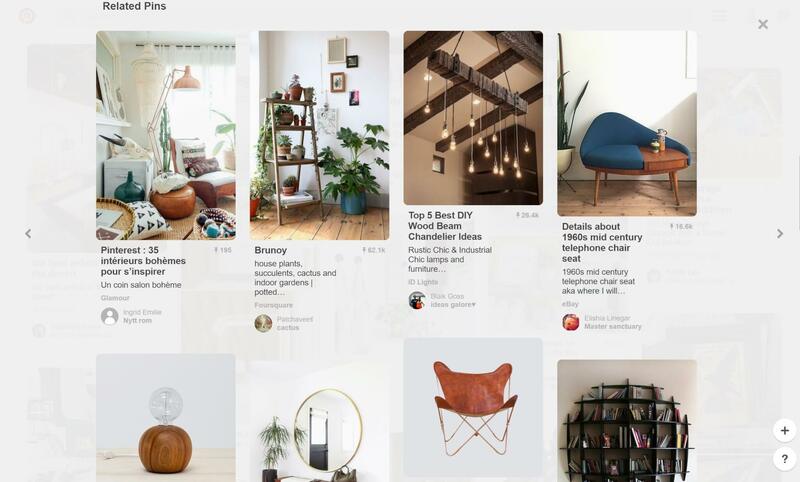 Pinterest stands out thanks to its large, image-heavy data collection that users themselves organize. In the past two years Pinterest has taken steps to do smarter things with all the images, and it does look like that’s paying off. “With a lot of the focus that we’ve had going international, you can imagine why visual signals would be really valuable there,” Mohammad Shahangian, Pinteret’s lead data science engineer, told VentureBeat in an interview at the startup’s San Francisco headquarters. Machine learning is at work across all four big parts of Pinterest: the home feed, search, related pins, and visual search. Today happens to be the one-year anniversary of the launch of the fourth of those. 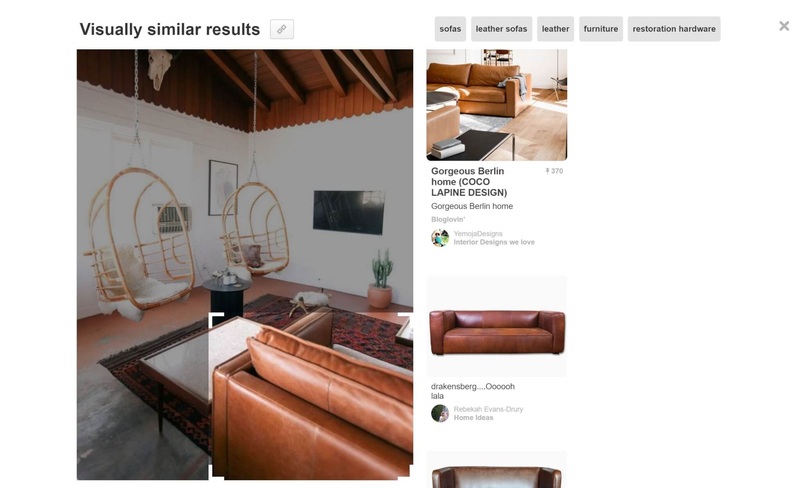 The way Pinterest uses it in visual search is certainly compelling. You just click or tap the magnifying glass in the top corner of a pin, and it will let you adjust the size and location of a rectangle superimposed over the image. The software then finds pins that are visually similar to whatever is in the rectangle. Additionally, in some cases you can tap any of the dots that appear on top of objects in an pin to bring up other pins that contain similar objects. Pinterest often already knows a lot about something that you’ve just pinned, partly because it knows that some other people have pinned it right alongside one or two or more other pins. That’s called co-occurrence, and it’s a powerful signal that pins are related. But sometimes — say, in another country where many people speak a less popular language — a user pins something that Pinterest has never seen even once before, and Pinterest can’t do much with the text associated with the pin. That’s where deep learning can make a big contribution. Similarities in the content of the pin can give Pinterest a clue as to what it might be. But. But! Deep learning is not the primary driver of recommendation systems at Pinterest, even though you might think that at that company, image data is king. But in January of this year, Pinterest went even further. The company stopped using a batch-processed machine learning system to re-rank content based on what users do, which could happen, say, overnight. Instead the company started doing real-time re-ranking, which takes just seconds — short enough that Pinterest can refine the order of related pins right as the person selects a pin to look at more closely. Employees have figured out that some kinds of content — like photography, and hair and beauty — do well in many countries, while others don’t. Wedding-related pins from the U.S., for instance, don’t usually play well in other countries. It seems that users like that, because in some cases this has led to increased engagement, a spokesperson told VentureBeat in an email. 75 percent of signups are outside the U.S.